Skyrider Shura (スカイライダー・シュラ, Sukairaidā Shura), the second priest of the Upper Yard, punishes criminals with the Ordeal of String. He tangles his enemies in nearly-invisible and unbreakable string and then attacks with his lance named Burn Lance. that has a Heat Dial inside. 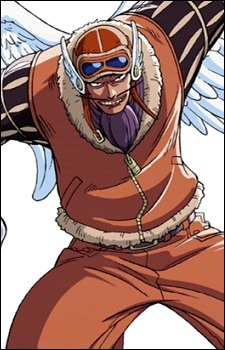 He rides a flying monster bird named Fuza, who has a Fire Dial in its mouth that allows it to breathe fire.